Pat Preller gave the first talk of our new year on “New Hall and Related Factories”. 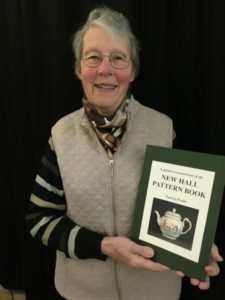 Pat is an expert on printed British pottery and has published two books on the subject of New Hall. 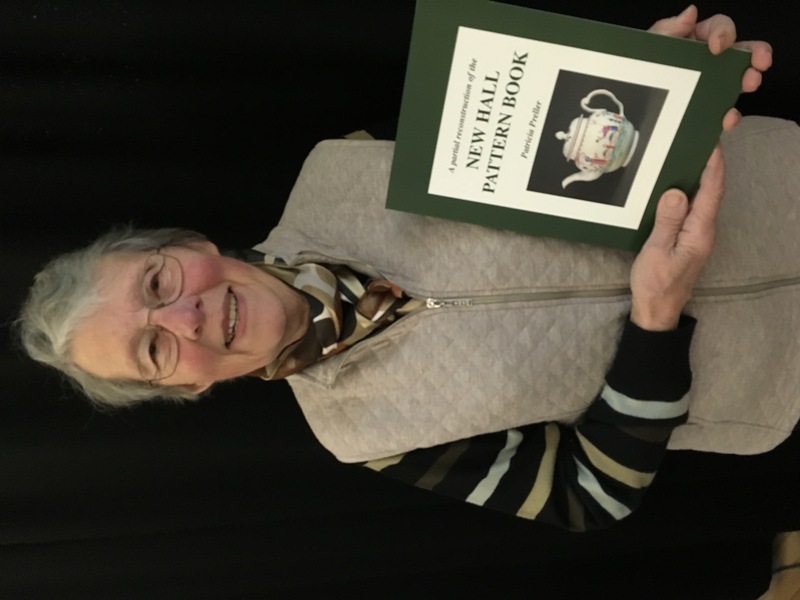 David Holgate’s book ‘New Hall and Its Imitators’ (1973) sparked her interest in New Hall. The New Hall Company is historically linked with two hard-paste factories in Plymouth and Bristol under the direction of William Cooksworthy and Richard Champion, who carried on successfully for a decade or so before the business suffered under the export restrictions imposed during the course of the American Civil War of Independence and although Champion tried to circumvent these measures, it was without success. Eventually the patents for the production of his hard-paste material were disposed of to a consortium of Staffordshire potters, Messrs Hollins, Keeling, Turner, Clowes and Bagnall. This consortium took control of the Champion’s business and in 1781 started production in an existing pottery belonging to Keeling in Tunstall, Staffordshire. However this arrangement was not to last and disagreements between the partners resulted in the departure of Turner and Keeling with the remaining members relocating the business to Shelton Hall, which belonged to Thomas Palmer. To avoid confusion, as Shelton was a common name in the area, it duly became Shelton New Hall and shortened to the New Hall. New Hall continued until 1835 when the site was sold for development and today there is a supermarket on the original site. Pat showed a comprehensive selection of slides of New Hall output highlighting the variety of patterns and illustrating comparisons to the related factories. New Hall produced practical domestic china – jugs, bowls, dinner services, dessert wares, punch bowls and a great many tea sets. Pat explained how to identify New Hall by its distinctive features – its handles; pedestal bases and spouts for example. The mark on the bases was often the pattern number preceded by a script “N” or the letter “No”. Often the patterns were quite distinctive although similar to other factories – sometimes trimmed with gold leaf, which made them look very sophisticated. Gold however was used quite sparingly at New Hall. Many Bristol shapes and patterns were retained and as time went on, a limited range was decided upon, notably teapots. Cream jugs were made to correspond with the teapots. New Hall Pottery is sometimes know as the “sprig” because many of the designs include a basket of flowers accompanied by scattered sprigs and has now become very collectable. There is an extensive collection in the V & A Museum in London including the “insect” decorated water jug and examples of Fidelle Duivivier’s work – a fine decorator of Ceramics, along with many other examples of cream jugs, tea bowls, mugs, teapots et cetera. This entry was posted in Uncategorized on 29/04/2018 by HHCG Admin.